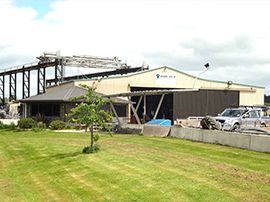 Dairy Tech is a dairy design and construction company based in Otorohanga – Waikato. We have been providing quality design solutions and construction integrity for farm dairies since 1985 – solutions that withstand the increasing demands of dairy farm management. The design of rotary platforms, gates, and yard services are part of a complete Dairy Design & Construction Package that includes pre-cast concrete components made exclusively by Dairy Tech. A range of add-on upgrade components allows significant improvement in efficiency of existing dairies. 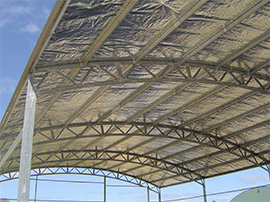 Dairy Tech applies the same design expertise to constructing curved truss buildings for commercial use. 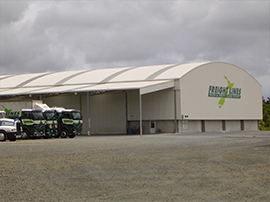 One recent project is the large fertiliser store in Otorohanga for Freightlines. 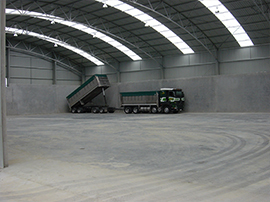 Farm structures designed and built by Dairy Tech include concrete farm-bridges, concrete underpasses for stock movement, silage pits, feed pads and fertiliser bins. Most components are manufactured by Dairy Tech and specialised equipment such as gate drive units are sourced from proven, reliable suppliers. Dairy Tech also provides Design Consultancy and a Maintenance & Repair Service.